Less than twenty years ago, most of the churches in Lviv were inaccessible. Of the scant few that were open across the region, most had been turned into museums of atheism. Yet Ukraine's independence from the Soviet Union in 1991 triggered a vast comeback for the christian faith. One by one the houses of worship reopened, and as money began to trickle back into the coffers, ambitious renovation programmes were set in motion. As it goes, few cities can boast such fine ecclesiastical buildings as Lviv, and nowhere does the ancient power of the city feel more alive than in these soaring relics of the past. Lviv's cosmopolitan history is given ample form by the three cathedrals that adorn the city: Roman Catholic (f. 1360), Greek Catholic (f. 1744) and Armenian Catholic (f. 1356) . Several other houses of worship, amongst them the former churches of the Dominican and the Bernardine orders, might easily be mistaken for cathedrals, such is the level of their grandeur. However, more diminutive treasures are also to be found, such as the exquisite Boim Chapel, founded by a wealthy family of merchants in 1611. The Great Fire of 1527 reduced much of the city to rubble and cinders, but not all of Lviv's monuments were destroyed. The Latin Cathedral suffered damage but it was quickly rebuilt, thus preserving its imposing Gothic form. The same can be said of the smaller Armenian Cathedral. Eastern Europe does not have many pure Renaissance buildings, but an impressive example can be found at the church in nearby Zhovka (Zolkiew), which was part of an ideal town planned in the Italian style. Meanwhile, in mannerist and baroque architecture, Lviv comes into its own. The late-Renaissance Boim Chapel is one of the city's most cherished monuments, a fantastically ornate piece at the foot of the Latin Cathedral. Perhaps the finest baroque edifice in the city is the former Dominican Church, which was attached to the convent of the same order. Today it has been reborn as the Greek Catholic Church of the Most Holy Eucharist. This magnificent building is at its most impressive from the exterior, especially when viewed from the Town Hall Tower or the High Castle. The sumptuous Greek Catholic Cathedral of St. George is a the city's finest Rococo building, perched above the city by the Ivan Franko Park. It has just emerged from a thorough renovation, as has the archbishop's palatial residence alongside. Most of Lviv's fantastic Secession architecture is at its most evident in the townhouses and mansions of the city, as well as the railway station. However, the Armenian Cathedral boasts some extraordinary mosaics and murals by Jozef Mehoffer and his pupil Jan Rosen. The Klimt-esque mosaics were executed by Mehoffer in 1912. For Neo-Gothic, a fine example can be found in the church of St. Elizabeth (1903-1912), now converted into a Greek Catholic house of worship. Many of the interior furnishings have not survived the passage of time, but one very important element has, the rather extraordinary art deco altar-piece. Lviv was famous for its art deco during the inter-war period, and this style permeated everything from posters to chocolate wrappers. Most of Lviv's houses of worship were blocked up during the Soviet era, the notable exception being the Latin Cathedral. However, the Roman Catholic Archbishop was compelled to leave the city in 1946, along with the thousands of Poles. The Greek Catholic Ukrainians were denied access to their own cathedral, which remained closed until 1991. 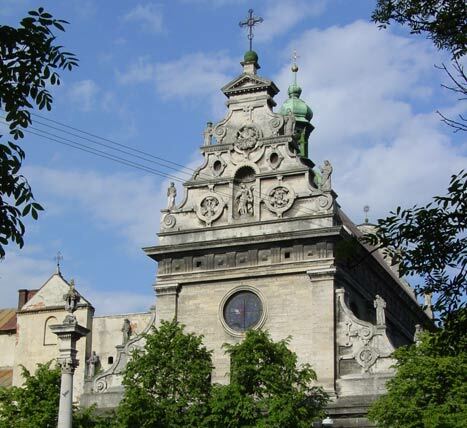 Ukrainian independence provided the watershed for Lviv's churches and cathedrals. The Greek Catholic Church took over many crumbling Roman Catholic churches. Certainly, many are still in dire need of aid, but the situation is emphatically better than it was ten years ago. The last significant house of worship to reopen was the Armenian Catholic Cathedral, which reinaugurated to coincide with Pope John Paul II's visit in 2001. Numerous renovation projects are currently underway in the city.